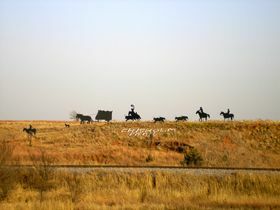 In 1867 Joseph G. McCoy, of Illinois, settled at Abilene, Kansas to engage in the cattle trade and he developed the Abilene Trail which connected with the already established north end of the Chisholm Trail near Wichita, Kansas. 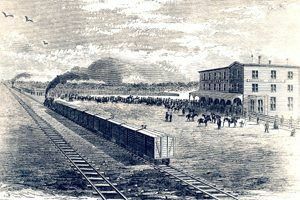 The path then ran northward to Abilene which was situated along the line of the Union Pacific Railroad, where the cattle could be shipped back east in a more expeditious manner. The road from the mouth of the Little Arkansas River to Abilene was not direct but circuitous. In order to straighten up this trail, bring the cattle more directly to Abilene, and shorten the distance, as well as counteracting would-be competing points for the cattle trade, an engineer corps was sent out under the charge of Civil Engineer T. F. Hersey. He, with a compass, flagmen and numerous laborers began to survey the route. The laborers utilized spades and shovels for throwing up mounds of dirt to mark the road located by the engineers. The trail ran almost due south from Abilene to the crossing of the Arkansas River and connected with the old Chisholm Trail. All along the way the new route provided for good water, abundant grass and suitable camping points. The exact combined route of the Chisholm and Abilene Trails had a number of offshoots from Texas to Kansas, so providing an exact location is nearly impossible. However, it crossed the Red River a little east of Henrietta, Texas, before continuing north across Indian Territory to Caldwell, Kansas, past Wichita and Newton, Kansas before it arrived in Abilene. 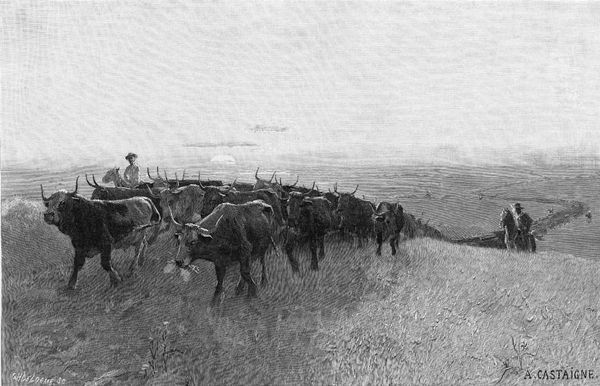 The first herd to follow the route belonged to O. W. Wheeler and his partners, who in 1867 bought 2,400 steers in San Antonio, Texas. At first, the route was merely referred to as the Trail, the Kansas Trail, the Abilene Trail, or McCoy’s Trail. In the end; however, the entire route from the Rio Grande River to Abilene would be referred to by most cowboys as the Chisholm Trail. In 1867 about 35,000 head of cattle were driven from Texas to Abilene over this trail; in 1868 about 75,000; in 1870 about 300,000; and in 1871 about 700,000, being the largest number ever received from Texas in any one year. However, by 1872 the area around Abilene was quickly being settled, grazing lands were getting scarcer, and the area residents began to object to the pasturing of great herds of cattle in the vicinity. 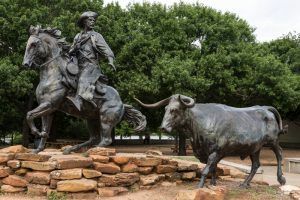 Due to these reasons as well as the fear of “tick fever” and the unruly conduct of the cowboys, the city of Abilene officially told the Texas cattleman they were no longer welcome in their town. The shipping points then moved to Wichita and Ellsworth. From 1867 to 1871 about 10,000 cars of livestock were shipped out of Abilene, and in 1872 about 80,000 head of cattle were shipped from Wichita. 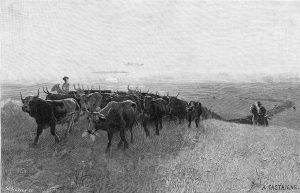 The settlement of the Arkansas and the Ninnescah River Valleys rendered it impractical to reach Wichita shipping yards after 1873, and the loading of cattle was transferred to points on the railroad farther west, halting finally at Dodge City, where 1887 saw the end of the use of the famous Abilene Cattle Trail. Chisholm Trail Statue in Waco, Texas by Carol Highsmith. Compiled and edited by Kathy Weiser/Legends of Kansas, updated March 2019.